A bold new way to enjoy our classics! 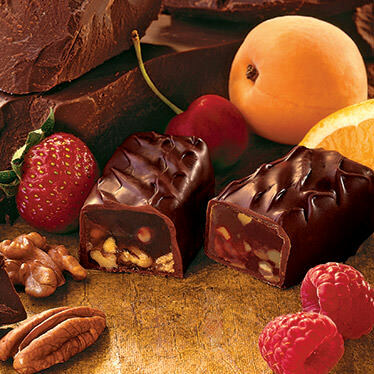 For those who enjoy the rich flavor of dark chocolate, we've taken our Classic Fruit Chocolate flavors and drenched them in semi-sweet chocolate. Kosher. INGREDIENTS: sugar, corn syrup, nutmeats (walnuts, pecans), chocolate liquor, modified corn starch, fruit [fruit juice from concentrate (strawberry, raspberry, apricot, cherry), dried apricots (contains sulfur dioxide, a preservative), dried cherries (cherries, sugar, sunflower oil), candied orange peel (orange peel, sugar, citric acid)], pectin (pectin, disodium diphosphate, sodium polyphosphate, dextrose, dicalcium phosphate), cocoa butter, butter oil, natural flavors, sodium citrate, citric acid, malic acid, milk. Superior tastes,I purchased these at BJ's Markets in Tonawanda New York. I can't say enough how I felt like I was given a Million Dollars. Thank You for this wonderful treasure of Chocolate . Even though we live in Florida with record-breaking temperatures in the 80's for Christmas week, the fruit chocolates arrived in good shape and are the best I've ever tasted. My dad passed on the love of Liberty Orchards products to me, having inspected and sampled through the years as an FDA inspector. He learned and I learned through him Liberty Orchards passes the FDA standards with flying colors and flavor you ask? 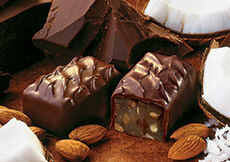 No one does it better and that goes for all products, not just the dark fruit chocolates! 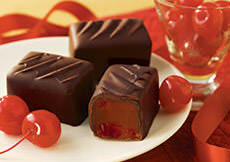 The Fruit Chocolates are the best I've ever had! 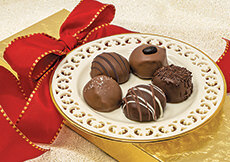 The rich dark chocolate accented with tasty fruit flavours is amazing! The orange and raspberry flavours are my favorite!! I love all the different flavours it comes with too! It's hard to just eat one, you have to try at least some of every flavour! 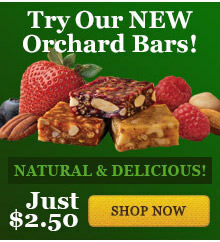 Thanks Liberty Orchards for the literally the BEST candy! I ordered these candies for Christmas gifts this year and they were a big hit for those who received them. First time trying these candies. I like almost anything with dark chocolate, but the chocolate with the jelly-like texture and the nuts is a great combination. Good job!! I like dark chocolate and wish that you had more products with dark chocolate. These have been excellent. I purchased these as an addition to my Christmas lunch for guests. Everyone loved these chocolates. I will definitely purchase these again.